This new hosting system is built with Drupal 7 as front end, and with MySQL serving as the back end database engine. The goal of this service is to create a general purpose database hosting platform that is not only powerful enough to satisfy most functional requirements, but is also secure, reliable, and scalable so that our valuable data may be preserved for future generations. Business processes and rules integration. 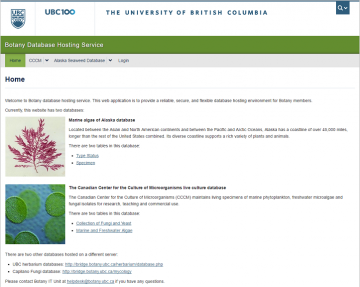 Currently, we have the Alaska Seaweed Database and the CCCM (Canadian Center for the Culture of Microorganisms) Live Culture Databases hosted on this service. Two virtual servers has been purchased from UBC IT VSS. One has been configured as the database hosting server, and the other has been configured as the web interface server for this service. This is a hosting service for FileMaker Version 12 databases and PHP based database interface websites. This service does not support database files based on older versions of FileMaker. This service does not support other Web Application (such as XML, ASP, Perl, etc.) or database technologies (such as MySQL, PostgreSQL or MS SQL). The permanent DNS name for the database hosting server is herbie.botany.ubc.ca. FileMaker Pro 12 users may open a remote database file hosted on this server if the user has the privilege defined in this file and is using a computer located in a registered user network. By default, all Botany subnets, the “ubcsecure” wireless network, and the UBC myVPN network are registered user networks for FileMaker Pro 12 access to the database hosting server. Other networks can be added as registered user networks if this is required by the customer and is deemed appropriate by Botany IT. The permanent DNS name for the web interface server is bridge.botany.ubc.ca. Any user from any network may browse a website hosted on this server through the HTTP protocol (TCP port 80). By default, all websites have a URL following the following template: http://bridge.botany.ubc.ca/<username>. It is possible to point other domain names to this server, but it will be the user’s interest to optionally obtain another domain name. Botany IT staff can set up Virtual Server resolution once the user points the domain name to this server. The customer may be given computer account(s) and appropriate privilege(s) to perform database and/or website management through Windows File Sharing and Remote Desktop Connection (from a computer located in a registered administrator network) if this is required by the customer and is deemed appropriate by Botany IT. By default, all Botany subnets, the “ubcprivate” wireless network, and the identity based UBC myVPN network are registered administrator networks for Windows File Sharing and Remote Desktop Connection (applicable to both servers in this service). Other networks can be added as registered administrator network if this is required by the customer and is deemed appropriate by Botany IT. The customer may be given access to FileMaker Server Admin Console if this is required and is deemed appropriate by Botany IT. By default, all customers are limited to 100GB of space usage on both servers in this service. The Botany IT manager may approve resource requests within a 200GB space limit on a case by case basis. Otherwise, the request must be approved by the Botany IT Advisory Board.